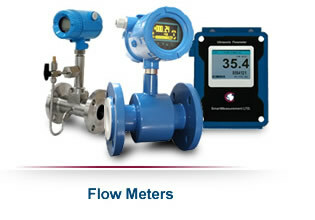 Flow meters measure the quantity of liquid, vapor or gas that goes through them. There are flow meters that work by measuring the quantity of fluid going through them within a specific period of time. Some flow meters quantify the total fluid amount that passes through. Flow meters generally consist of the main device, transducer and a transmitter. The purpose of the transducer is to sense the fluid that goes through the main or primary device. A flow signal is produced by the transmitter from the transducer signal. The components are typically combined and the flow meter may be a single or number of devices. A volumetric flow meter directly measures the amount of fluid that passes through the device. Positive displacement flow meters are the only technology available for directly measuring volume. A velocity flow meter uses methods that measure velocity of flowing streams to establish volumetric flow. Turbine, magnetic and ultrasonic flow meters are examples of flow meter technology that can measure velocity. A mass flow meter uses techniques to measure mass flow of flowing streams. Thermal and Coriolis flow meters are examples of technologies that can be used for measuring the mass flow. Inferential flow meters measure flow by concluding the value based on the other parameters that are measured. 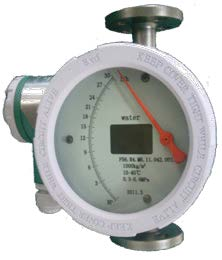 Differential pressure and target flow meters are examples of technology that measure flow inferentially. Other forms of flow meter technologies consist of flow meters that are designed to measure the flow of liquid in open channels. Insertion flow meters measure flow at a single location in the pipe and the measurement is used to deduce the flow in the whole pipe. For liquid service, it is vital to ensure that the flow meter is always full of the liquid to prevent the presence of vapor or gas in the device and altering the geometry, which can have a negative effect on accuracy. For gas service, the flow meter should be full of the gas or vapor to avoid the inclusion of liquid that changes the geometry and affects accuracy. Disruptions within the upstream and downstream of a flow meter can negatively affect accuracy when the flow meter is unable to measure disrupted flow streams. Each flow meter has specified applications and installation restrictions. There is no flow meter that suits all applications and the flow meter that you select will be based on the application rather than the technology. Many technologies work well with a variety of applications. You can choose the technology that you want to use according to cost, accuracy, durability and dependability instead of making the technology fit your application. Different meter designs are suitable for different applications. Flow measurement continues to be a vital element of operations that involve industrial systems such as pumps and valves. Users who choose flow meters for measuring liquid or gas flow need to consider a number of factors that will determine the best decision. Meter designs have significant differences and each device has its own distinct features. James Rut is a professional writer who dabbles in photography. He enjoys being creative and coming up with different interesting ways to inform and entertain his audiences. When he is not busy writing or taking snapshots, he likes to watch his favourite shows. Read more about flow meters here.